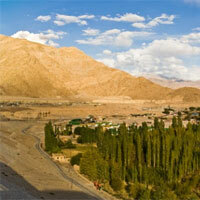 Ladakh is one of the most beautiful and awe inspiring places in the world. It is bestowed with beautiful landscapes, meandering rivers, sparkling streams, meandering glaciers and mesmerizing wildlife. Itâ��s no wonder that it attracts thousands of visitors from around the world. Black-Necked Crane :-Probably Ladakhâ��s flagship species . through can be seen in Arunachal this is the only place to see it in summer. Seen mostly in changthang in marshes and bogs the best place to it is Tsokar and Hanle. Tibetan Sand grouse: - A beautiful sand grouse seen above 4,200m in midsized flocks on stony planes. Best places to see Tsokar. Snow leopards:- Ladakh is famous for its nature history, Ladakh has been termed the snow leopard capital of the worldâ�� and attracts tourists, who came in the hope of sighting this large cat. However give the fragile ecology of the habitat in Ladakh. Tibetan Argali , Wild Yak, Antelope. All India Tours.